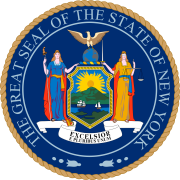 The 1875 New York state election was held on November 2, 1875, to elect the Secretary of State, the State Comptroller, the Attorney General, the State Treasurer, the State Engineer, a Canal Commissioner and an Inspector of State Prisons, as well as all members of the New York State Assembly and the New York State Senate. Dr. Hayward: Thank you very much, Emma. Ladies and gentlemen, it's a real delight to be back in Hillsdale again - a part of normal America - you know, this week is a heavy travel week: I'm going to be at Yale University on Friday, where I'm going to do my best to point out to them that they have a lot of changes they need to make if they want to be known as the Hillsdale of the northeast. And, as a few of you know, I recently finished ... I should maybe say, I recently survived a year as an inmate at the University of Colorado at Boulder, which is Berkeley with snow, right? In a fit of madness, they decided they wanted to hire a conservative to come try out for a year ... or, actually, three years was the idea, and I said I would try it for a year and no longer. Boulder, of course ... their idea of a conservative at Boulder is a Trotskyite, right? And so, after I got there, I thought, this'll be interesting, I'm kind of a gonzo guy, I've been at Berkeley, how hard could this be? And I had a lot of fun with them, because I get invited to all kinds of liberal audiences who wanted to see this exotic zoo animal in their midst. And the first thing I would tell them is, "You know, you have it all wrong. I'm going to let you in on a little secret. I shouldn't, but I will. Conservatives love Boulder." And they would say, "Really?" And we love Boulder especially for the "green belt" that's around it. The environmentalists, 30 or 40 years ago, put in a green belt to control growth and preserve their quality of life, and I said, "The green belt is the best feature of Boulder. I wish they had one in Berkeley. I mean, the green belt makes the quarantine so much easier to enforce. You see, it's easy to have our Tea Party picket line set up around the perimeter, and, you know, when a liberal's trying to escape, out in the real world, we round them up, hand them a bag of fresh, organic kale, and send them back into the village. And, you guys, just stay there. It's perfectly fine with us if you wreck Boulder, and Madison, and Cambridge, and Berkeley, if the rest of America is relatively safer. And then, usually, things went downhill from there. I had a great time, actually. I was actually embedded, for a semester, in the environmental studies department. And, boy, that was fun. I'm going to begin, tonight, with my conclusion. And then show you how I got to this conclusion. My conclusion is that, decades from now, I think historians are likely to look back on the hysteria over climate change today the way we, today, look back on prohibition: as a comic misadventure that shows the harsh limits of political enthusiasm directed against basic facts of nature and society. However - and here's the complicating part - whether we'll avoid committing the folly of embracing the energy equivalent of prohibition is still undecided. I'm thinking that we won't, but it may be a close-run thing, for a very simple and elemental reason, and that's the environmental movement, which is deeply authoritarian at its core, has an unquenchable will to power that cannot be satisfied and will not be denied. And, so, the fate of this is in the balance, as Al Gore might have said in a different way, and, as I say, we can't tell, yet, whether this will be looked back upon as a comic misadventure or a tragic misadventure. Now, the formal title of my speech this evening is, "A Funny Thing Happened on the Way to Global Warming." And I love this title. I wasn't sure, though, whether Tim Caspar and Doug Jeffrey weren't being mischievous, a little bit, thinking that my, you know, double chin ... I was starting to look like Zero Mostel - you need to be a little older to get that reference, I know. But I do like the title. But, actually, three funny things have happened on the way to global warming. Three of them. First, the warming stopped. Imagine that. Second, the policy agenda of the "climatistas," as I call them ... or, an even better term for the climate crusaders is, "Thermageddonites." I didn't think of that. That's Briton's Lord Monckton came up with that, and I think that one's really good. But the policy agenda the climatistas has been revealed to be completely absurd. And I'll walk you through that here in a moment. But there's a corollary to that. As a thought experiment, even if catastrophic human-caused climate change turned out to be true, environmentalists are the last people we would want to put in charge of dealing with the problem. Full stop. When I'm in a mischievous mood, I did this at Boulder a lot; I would say to environmentalists, I said, "Look, let's just quit arguing about the science. It's really tedious. But, only conservatives could fix this, you know." And that was always fun. The third funny thing that has happened is something that no one predicted. There's been some talk about it today at lunch and other presentations, and that's the revival of the oil ... gas ... energy sector through the technological revolution of directional drilling and "rock massaging"--that's what I call fracking, "rock massaging." No one saw this coming. As recently as ten years ago, all the official forecasts, including of a lot of the energy companies--ExxonMobil's annual forecast, British Petroleum--they all predicted continuing declines in gas production in the United States, and by the year 2020, not far off from now, the United States was predicted to be importing 20% of its natural gas from, guess who? And now, that has all changed. And the important thing is this: this all happened very quietly out in the private sector, as was explained at lunch today, and if our political class in Washington, in the media, had known this was going on, they surely would have done something to stop it. And that's what they're trying to do now, of course, but there's too late, there's too much momentum. Aren't markets and innovation wonderful? So, let's take these in order. First, about the warming stopping. Between roughly 1978 and 1998, a 20 year period, the catastrophic global warming scenario seemed to have some evidence on its side. During that roughly two decade period, the global average temperature rose suddenly and sharply by about four tenths of a degree Celsius, and conveniently that was right in line with what a lot of the newfangled computer climate models predicted. But then, as we say, the funny thing happened: it suddenly stopped. Even though greenhouse gases kept rising the atmosphere at a steady rate. Now, at first, the pause, as it's come to be known, could be plausibly attributed to random year over year variation, what ordinary people call, "weather," or, what the scientists call, a, basically, chaotic climate system, that they will quickly acknowledge they don't fully understand, and a couple other one-off events like the Mount Pinatubo eruption in 1992, which changed some things, but now we're going on 18 years ... really, almost 20 years depending on how you treat 1998, which I won't do now, but we're going on 17, 18, up to 20 years without any warming, and all the models are starting to be falsified. The actual temperature record is now falling below 95% of the climate model temperature forecast. In other words, 95% of the projections are proved to be wrong. Because there isn't just one, by the way, if you get into this misery. There's several dozen different computer climate models generating a different temperature forecast. And the record of the last two decades is now falling below the lowest forecast for the future. All but about one or two of the models are basically still in the ... If this goes on for another five to ten years, 100% of the models will be shown to be wrong. Because the basic theory says we should be continuing to increase about two-tenths of a degree per decade as long as greenhouse gases are going up at the rate they are, and it's not happening. It is becoming the biggest embarrassment for the scientific consensus since Piltdown Man. You know, somebody today asked Ken Greene about, or made reference to the email scandals of the East Anglia climate unit in 2009. There's one of those emails from climatologist Kevin Trenberth, he's one of the deep-dish climate alarmists at Boulder, and he said, in one of those emails, and I'll quote him here, he said it was a "travesty" that climate scientists could not explain the pause. And that's five years ago, now, and we're still pausing. They've been scrambling ever since to offer a whole series of explanations, and the intergovernmental panel on climate change, the U.N.'s I.P.C.C., as Ken mentioned today, they're doing their best to paper this all over and twist and shout and do everything they can to try and cover up the fact that their scheme is failing. I think maybe my favorite moment in the media ... there's only a couple people in the media who cover this honestly ... one of them I should give fair credit to is Andy Revkin at the New York Times, who's pretty environmentalist in sympathies but pretty much plays this issue straight. Good for him. The other is The Economist magazine, which is otherwise very much within the so-called consensus, and they wrote, back in March, quote, "If climate scientists were credit rating agencies, climate sensitivity would be on negative watch." Good for The Economist. Now, I'm a glutton for punishment, so ... this is why Ken and I are friends, I guess. I read through a lot of the latest I.P.C.C. report on climate science. It came out about a year ago. The science report is, you know, 1300 pages long or something. In particular, if you're a glutton, I recommend reading chapter nine. It is called, "Evaluation of Climate Models." It's 218 pages long, 218 pages of very small print, and, Ken said you can't quote it; actually, you can't even read it. That's not quite true; it takes a long time to figure out what's going on. You know, these days, if the complaint made of people like me and Ken if we say the word uncertain or uncertainty it's bad faith. A chapter on computer climate models from the U.N., it has the word uncertain or uncertainty 173 times in 218 pages, and it uses the term error or errors 192 times. I'll describe a couple of these errors and uncertainties for you. What they try to persuade you is we keep twisting the knobs on these computer models long enough we can get it to match up with what's happened. Except you keep going and you realize they can't even do that. And they admit these things very grudgingly and talk about how certain areas of essential knowledge of how the climate system works continue to really elude our grasp. In particular, clouds. Clouds and water vapor. That's really important to the story. So, let me quote one quotable part, which goes like this: "There remain," this is a quote, now, "There remain significant errors on the model simulation of clouds." Next sentence. "It is very likely that these errors contribute significantly to the uncertainties and estimates of cloud feedbacks, and, consequently, in the climate change projections." And, if you really read it carefully and ... ten times ... you realize that they admit that it's possible that clouds ... they admit that clouds could cancel out most of the forcing effect of greenhouse gases. This is what people like Richard Lindzen have been saying for a long time. Now, I'm not just a glutton for reading these reports when they come out. I went to the trouble of finding some of the drafts leading up to it. You can get people to leak these things to you. And one of the last drafts before the final report came out had this sentence in it. In that same chapter nine, which I thought was quite curious. Here's the quote: "The ability of a climate model to make future climate projections cannot be directly evaluated." Let that sink in for a minute. We can't even evaluate our models. That sentence was dropped from the final report. I'm sure someone said, hey, wait a minute, we can't say that. Instead, after a lot of mumbley-mouth stuff about, you know, why the pause is happening and we're still confident that we want to keep playing with our knobs, this sentence appeared, instead. This one's even better, actually, when you think about it. Quote: "These projections were not intended to be predictions over the short time scales for which observations are available to date." Translation: pay no attention to our models behind the curtain. Just trust our judgment that the end is near. You know, the great social scientist James Q. Wilson used to say that social scientists should quit trying to predict the future because they can't even predict the past. I think the climate science community might well heed that advice. Where is the missing heat if you just want to go from the orthodox climate theory? Most of the climatistas say it's going into the deep ocean. And while that's a plausible theory, we have very little data to substantiate it, and some data that's coming in recently suggests that it's not happening. And we have even less understanding about how that might play out in the future. Other explanations for the pause include unusual western Pacific wind patterns--I'm not making this up--aerosols, which means, you know, a higher level of particulates in the atmosphere, and, my favorite, increased solar variation. There's this thing up in the sky called the sun. You may have seen it. And, what's strange is, an awful lot of people, I mean, not just ordinary citizens who wonder about this, but scientists, even, would say, you know, what about variations in solar radiation and sun spots and the climate science community, as always, says, no, and their official models, if you read them, say it's a very tiny factor in any variation in the climate, and so, for them now to say solar variation is driving the pause, that's interesting, isn't it? How convenient. We're up now to something like 57 possible explanations for the pause. I think they're pulling that off a ketchup bottle. Right? Now, the pause and the admittedly persistent limitations and errors of the computer climate models resemble in my mind the kind of anomalies that the philosopher and historian Thomas Kuhn famously explained should constitute a crisis for a dominant scientific theory. And while the climatistas refuse to acknowledge it, this crisis is causing some serious second thoughts about the basic question of climate sensitivity. In other words ... Ken gave a short primer on this afternoon, if you were here. It's true that greenhouse gases hurry the temperature a little bit, and the climate sensitivity models have always said, and they've always been rigged to say, it's going to do a lot! And there are more and more studies published in the peer reviewed scientific journals saying, know what? We have been systematically overestimating climate sensitivity. It's much, much lower than we've been led to believe, and ... really, what this comes to is, this is a non-problem. Or not the kind of problem we've been told about. But instead of confronting the fact that their cause has floundered mostly of its own dead weight, the climatistas have ratcheted up new levels of bad faith and grasping authoritarianism. That's the technical terms for what they're doing, I think. The result of the latest catalog of exaggerated claims and appalling clichés is, you know, it's endless, but the most egregious one is one that I'm sure many of you have heard of or seen on T.V. It's the ubiquitous refrain that 97% of all scientists believe in climate change. By the way, they even use that word; believe, like it's an article of religious faith, which I think is also a curious thing. And it's not just climate advocates. NASA, a federal government agency, says ... they have a web page that says, that phrase, 97% of scientists believe in climate change. That's our government speaking, now. And, of course, the political suggestion behind this is, if 97% of scientists believe in climate change, then, therefore, they must all agree with the environmentalist agenda to suppress energy. So, where did this 97% figure come from? When you explore its lineage, it turns out to be about as convincing as a Chicago election. No, you can't believe that, right? ... The most prominent form of it comes from a paper by a professor in Australia named John Cook at the University of Queensland, and he published this paper in an obscure journal, and it's just rocketed around and it's become the big thing. And what this study purported to do was review the abstracts of 11,000 climate science articles. Now, just stop right there. It's important they say, abstracts. No one's going to read 11,000 climate articles. Even a whole team of graduate students is not going to read through 11,000 science articles. So they read the abstracts, fair enough. The abstract is always that one paragraph summary at the head of any academic journal article. Well, here's the abstract to the Cook paper, which no one in the media seems to have the wit to read for themselves. First sentence: "We find that 66.4% of abstracts expressed no position on anthropogenic global warming, comma." I'll stop right there. Two thirds--66%--two thirds of the papers express no opinion on human-caused global warming. Let's keep going. Thirty-two point six percent endorsed anthropogenic global warming. Zero point seven percent rejected it and 0.3% were uncertain. Okay. So that means a third of those papers had an opinion on human-caused global warming. So, the next sentence says this: "Among abstracts expressing a position on human-caused global warming, 97.1% endorse the consensus positions that humans are causing the warming." Somehow this has become 97% of all scientists, when it's 97% of a third of scientists. Or, you might put it this way. You could just as easily say, 66% of scientists publishing in the field have expressed no firm opinion on the matter. Or, still another way to think about it is, this is the grandfather of all simple-minded tautologies. Among all the scientists who agree with the consensus, are all the scientists who agree with the consensus. That would be an adequate way of saying it. Now, initially Professor Cook refused to share the data with anybody else to how they've been coded, and, what have they matched up. That's always a bad sign right there, isn't it? But, of course, in the modern world, with things planted on internet databases, somebody found the data. And, lo and behold, some of the articles turned out to be not really about climate science at all. One article that was billed as a science article was about U.S. media coverage of climate change issues. Strangely, in those 11,000 papers, there's not a single one from Richard Lindzen of M.I.T. He's the most prominent skeptic in the climate science community, who has been publishing on the subject since 1961. None of his papers were included, somehow. And yet, this phrase ... I mean, you can't go anywhere now without seeing it or, you know, get on the center for climate progress without seeing that 97% of scientists agree. Or believe in, right? Well, it's clear that the climate establishment has become as narrowly intolerant as any department of gender studies on a college campus, and for much the same reason. What this really masks is a will to power, as I said at the beginning. There's a pretty good new book out on American environmentalism, called Climate of Crisis, by Emory University historian Patrick Allitt. It's not a bad book, I reviewed it last week in the Weekly Standard, and he thinks that the next generation of scientists, like previous generational successions, will seek to overturn the conventional wisdom of the current community. I hope he's right about that. Now, I understand the academic dynamic, but I'm not so sure. I don't think it's like history, where each generation of historians likes to say the previous one was all wrong about the American founding, or something, right? I'm not sure it works that way in science. I think he underestimates how deeply the environmental movement is invested in the idea of catastrophic climate change. But, that leads me to the second funny thing that happened on the way to global warming, and that's the still incomplete realization of the sheer absurdity of the climate policy agenda. Now, global warming was always the dream issue for environmentalists, because it gave them license to commandeer the entire energy sector of the entire world. And, as energy is the master resource that enables all other resource use, it's the ... I would say, the platform for material human progress itself. Getting control of energy is the commanding height of human civilization. But, what they have proposed is a transformation of the world's energy system so sweeping and so unrealistic that it would make King Canute blush with embarrassment. And, here, I'm going to have to walk you through a few numbers. I tend not to like to try and do numbers in a talk like this, because it can be hard to follow. I didn't want to do PowerPoint for the same reason as Ken, because numbers on a screen are even worse, in some ways, because you can't see em. So, I'm going to try and stick with me on this, and I'll make this as straightforward and comprehensible as possible. But, you begin with this. The target of climate policy orthodoxy is an 80% percent reduction ... eight zero ... 80% reduction in carbon dioxide emissions worldwide, not just the United States, worldwide by the year 2050. Eighty percent reduction by 2050. I call it for shorthand the 80 by 50 target. No one actually knew what this meant in practice until I and a few other people got after it. And ... you know, you throw out these large ... 80% of something, and, you know, six billion tons of emissions. What does this all mean? It's hard to know when you're throwing around these ... my eyes glaze over numbers, right? Well, here's how this works, and I'll translate this into real terms for you. The big round number you start with is that ... it's changed a little bit, but this is good enough for our purposes, here. The figure that the Department of Energy starts with from a few years ago is ... The U.S... . we'll just use the U.S. for now ... U.S. emitted about six billion tons a year of carbon dioxide. That's about 20 tons per capita. Twenty tons for each of us. Now, 20 tons sounds like a lot. One little fact that's fun is, each one of us individually exhales about 800 pounds a year of carbon dioxide, just from breathing. So, you can see, a nice down payment on the way to your 20 tons, just from breathing in and out. So that's not really that much if you think about it, then. Twenty tons. Now, an 80% reduction ... actually 83% in the Waxman-Markey Bill, but don't worry about that ... it takes us down to about 1.1 billion tons. Or, if you want to just keep it simple, we're going from six billion, roughly, in round numbers, to about one billion. Now, the first threshold question I got curious about was: when was the last time the United States' carbon dioxide emissions were that low? You can figure this out ... takes a little bit of work; it's not that hard ... you got to go through the historical data tables that are available. And, the answer you come to is that the U.S. last emitted a billion tons of carbon dioxide around 1910. Maybe 1905. That's another calculation someone else did that's pretty good. In 1910 the U.S. had only 92 million people. If you do the math, that meant we had about ten tons per capita emission. So, about half of the level we are today, with 92 million people. However, in the year 2050, if the census bureau is right, we're going to have about 420 million people in this country. What that means is, if we're going to have to stay under a billion tons of total emissions for the whole country, each one of us will have to lower our per-capita emissions to 2.5 tons a person. That's one quarter the amount our great, great grandparents emitted 100 years ago. When, by the way, their incomes were, you know, a fraction of what they are today. Didn't have air conditioning, didn't have flat screen TVs, didn't have a lot of refrigerators. Didn't have many cars. You're starting to see where this is going. I did look up ... when was the last time the U.S. was ... I think, by the way, U.S. carbon dioxide emissions may have never been that low, even in the colonial era, when we were only burning mostly wood and some whale oil. But, from the data tables, I was able to figure out that the last time we were at 2.5 tons per capita of carbon dioxide emissions was 1875. There is a technical name for this kind of policy target. That name is Looney Tunes. This is not going to happen in 36 years or whatever that time frame is off from now, right? There are a few nations that emitted 2.5 tons per capita that we can look at as possible models. Belize, Mauritius, Haiti, Somalia ... you get the picture. Desperately poor countries emit at that level because they're poor. By the way ... this is also something that any sensible person understands ... really poor countries, what are their environmental records like, overall? They're really, really bad. Their water's terrible, they cut down all their trees, they overgraze their land, they pollute their water terribly ... you don't want to be that kind of country. That's not how you solve environmental problems. You need to get rich to solve environmental problems. What about those enlightened Europeans? Well, the best countries in the world that are industrialized and wealthy are France and Switzerland. They both get about 90% of their electricity from nuclear power and hydro power, which have no greenhouse gas emissions. And, they're compact countries, right? People don't drive a long way in France or Switzerland. They don't have to ship to, you know, Paris to Lyon ... they don't ship goods very far in that country. Agricultural goods or any other. Here, we ship stuff from Chicago to Los Angeles, right? We ship things a long way. We're not the same. But, even there, those two countries, with all their super green policies, their per capita emissions are 6.5 tons per capita. You know, two and a half times the target we're told we have to meet by the environmentalists. I could go on with this, and ... I might go just a little bit more to give you a little bit more grasp of this. I'm still on sort of large numbers, right? Per capita and all the rest of that. Give you one more example of how crazy this is. Remember, our target's about one billion tons. Now, when the Department of Energy does these assessments and gives us our emissions inventory, they break the U.S. economy into four basic sectors. Residential: our houses, and apartments, and condos, and whatnot. Commercial: office buildings. Industrial: our factories. And, transportation: how we all move around and move our things. Those four sectors. So, remember. One billion tons for the whole country in 2050. All four sectors. Right now, the household sector. Just living at home, making our coffee. We emit 1.2 billion tons of CO2, just from our houses. That's, you know, 20% higher than a target for the whole country for everything 36 years from now, when we're going to have a whole lot more people. Now, if we have the same pie in 2050 as today, and that could change, but it's worth using the same pie, or same share, it means the household sector in the year 2050 would have to emit no more than about 205 million tons. Instead of the 1.2 billion we emit today. So, I decided to break that down even further. To figure out some interesting things. How many of you here who have houses ... some of you are students, I know ... how many of you have natural gas in your houses? For your furnaces? Yeah ... yeah, a bunch of you, right? And that's the state of the art for new houses. It's much more efficient than electric heating. Remember I said 205 million tons for the household sector in 2050 for everything? Today, CO2 emissions just from natural gas use in our houses, before you flip a single light switch: 237 million tons. So, our natural gas use today is already higher than what it's supposed to be in 2050 for the whole household sector for all uses. I mean, the Department of Energy projections ... they're all saying, this is a joke, right? You know, household use of energy overall is going to be much higher by 2030. That's as far out as their projections go, right now, is 2030. We're supposed to be building something like 40 million residential households in the U.S. I can go on with this. I have sort of gone down ... drilled down even further to point out that if you try and do this through conservation ... that's what some of my friends in the Natural Resources Defense Council say ... let's just do conservation ... and are we really going to weatherize the entire housing stock? Well, it turns out you can't do that if you try and ... if you run through the numbers, what you find is, you don't even have enough electricity to run your hot water heater. Forget flat screen TVs or refrigerators. Same thing's true of transportation. I'll just give you one last thing, here, and then I'll stop with numbers. Right now, our cars and trucks consume about 180 billion gallons of motor fuel a year. Now, again, if the transportation sector's going to stay within our total emissions budget, we'd have to shrink that down, at best, to about 30 billion gallons. Well, the last time we consumed 30 billion gallons for our cars and trucks and transportation was 1930. If every single person in the country drove a Toyota Prius, in 2050, we'd still overshoot the transportation sector emissions target by 40 to 50%. And that ... I've left out airplanes, by the way. Airplanes are actually small of our total, but it's like 5% of our total fuel consumption, is airplanes. And no one's yet figured out how you're going to electrify an airplane. We may electrify cars someday, better than we're doing now, you know ... Teslas are kind of fun, but they're not very practical, nor are they affordable for an ordinary human being. So, the clear implication of this target is that we have to replace the entire fossil fuel energy infrastructure over the next three decades. That's what they're telling us to do. And not just the United States, but for the whole world. Even if it could be done at all, and I think it can't, it would be a multi-trillion dollar proposition. Let me share with you an interesting couple of sentences from the International Energy Agency. They're folks based in Paris, they do really good international energy analysis ... they publish a world forecast every year that's really good ... and, they were discussing this problem. And, they said this. They make reference here, by the way, to the 450 parts per million target, that's part of climate ... I won't bother explaining that now, but, I don't think you need to know it to understand what the sentence means. Here's the quote from the I.E.A. in 2008: "In other words, the O.E.C.D. countries" ... that's, you know, the industrialized countries of the world ... "the O.E.C.D. countries alone cannot put the world onto the path to 450 parts per million even if they were to reduce their emissions to zero." Pause there. What they've just said in that sentence is, the United States, Europe, Japan ... could disappear off the face of the earth and the world would still not come close to the target of climate orthodoxy. Why? Well, because China and India are growing, and Brazil, and, you know, Africa would like to develop. So would the rest of Asia. And, by the way, they're doing that mostly with coal. Let me come back to the point in a moment. Let me continue with what the I.E.A. said: "Even leaving aside any debate about the political feasibility of the 450 policy scenario, it is uncertain whether the scale of the transformation envisaged is even technically achievable as the scenario assumes broad deployment of technologies that have not yet been proven. The technology shift, if achievable, would certainly be unprecedented in scale and speed of deployment." This is remarkably direct language from one of these international bureaucracies. And when this came out, guess what happened? All hell broke loose from the climate community. They denounced the I.E.A. and essentially they forced them to retract this statement. Next year they said, oh, we can do it ... you know, they went back to the usual happy talk clichés of unicorn flop sweat and all other ... you know, banana peels, and all the other things we can power the world with. They got hammered for that bit of honesty. Because that's what the climate campaign is like. One of the things that's important to understand is that energy transitions are very long. That was true with past energy transitions from wood to coal, from coal to oil, and now we're making a transition in this country, and others, to natural gas. Transitions are long for the same reason that the turnover in our housing stock tends to be long. Our energy systems represent large, long-term, fixed capital investments, and you don't generally replace large infrastructure before its useful life is over. Because that's economically wasteful. It'd be like remodeling your whole house because you don't like the color in the kitchen and the bathroom. Or replacing your 2-year-old refrigerator with a new model because it's 10% more energy efficient. But that's the energy equivalent of what the climatistas want. They want a multi-trillion dollar outlay to replace energy systems that are not worn out and, importantly, whose conventional air pollution has already been reduced to the vanishing point. Now, I'm pretty sure ... in fact, I would bet a lot on this, that both Robert Bryce and Mark Mills tomorrow, who are absolutely fantastic ... they're going to go through some of the comparative defects of the current menu of alternative and renewable energy supplies. That make the environmentalists wake up happy in the morning. I mean, like, wind, and solar, and bio-fuels. Suffice it today as a placeholder until you hear from Robert and Mark tomorrow is, they're vastly more expensive and not scalable to global or even national needs, and in many cases have enormous negative environmental trade-offs of their own. Ken mentioned a few today about ethanol. That's true of wind and solar as well. Meanwhile, what is going on is, as in so many other domains ... the Obama administration's not waiting ... going to take executive action ... the Supreme Court, in 2007, improvidently told the E.P.A. that, yes, you can regulate greenhouse gases under the clean air act, a law written for a completely different problem with tools that are completely inappropriate to this problem, even if you think it is a giant problem. And, so, they have announced this very complicated and convoluted plan to regulate the electricity sector in the United States. And, as these things go, it's, you know, 675 pages of the main plan, and then the 400 page impact assessment that analyzes the costs and benefits, and it's very hard to understand. They emphasize their flexibility in announcing this. And each state has a different target based on its carbon intensity because, you know, some states like ... I've never looked at Michigan, but Ohio and Indiana get about 80% of their electricity from coal. Washington State gets almost none of their electricity from coal because they have all those old nuclear power plants and all those big dams on the Columbia River. So, different states have different electricity profiles, and they're trying to take this into account, although, of course, that's where the mischief begins, because a bureaucrat's flexibility today is their mandate tomorrow, right? So, there's all this language about, we'll have a menu of options, because, by the way, without getting into the legal parts of this, they can't directly say to an individual coal plant, you have to shut down or you have to reduce your emissions by some unrealistic amount, because that would fail a legal challenge. But they can do it indirectly, and bureaucrats are great at that. So look at this menu of things you can do: conservation, increase your heart rate, and, maybe even, they say, a cap and trade scheme between different states and different regions. And, although, you know, again, if you peel this apart very carefully, it looks like a wealth transfer from red states to blue states. Who knows what it will cost, but, the E.P.A. claims, with a straight face, that this scheme will reduce everyone's energy costs. Now, I've been asking the question ... there's several states, this one student this afternoon made a question about states with renewable portfolio standards. This is where we mandate you're going to get your electricity from windmills and solar panels. You can't point to a single state with a renewable portfolio standard where the energy costs have gone down. Quite the opposite. All those states have higher than average electricity rates. When Gina McCarthy, the head of the E.P.A., was announcing this back in June, I'm watching all these unbelievable claims, and I just kept thinking, when is she going to say, if you like your utility rates, you can keep your utility rates? That’s what she's saying, it was unbelievable. Contrast that typical bureaucratic dishonesty with Barack Obama himself. I'm going to give him a little credit for honesty, here. Back in the 2008 campaign he said this ... some of you may remember this quote: "Under my plan of a cap and trade system, electricity rates would necessarily skyrocket. Businesses would have to retrofit their operations. That will cost money. They will pass that cost on to consumers." End quote. I don't see why we shouldn't take him at his word. Now, I'll just give you one more. One of the E. P.A. fact sheets. Again, a glutton, I read through these crazy things. It's ... you know, I have no life, I guess. One of the E.P.A. fact sheets says the following: "We expect" ... this is a quote, here ... "We expect extensive and very rapid changes in the structure of the power sector." Again, once you fight your way through the fog of bureaucratese and learn how these things work, you understand what they're really proposing is to make the E.P.A. a federal public utility commission. And, they're going to regulate the electricity grid, now. Now, the way the clean air act works, in shorthand is, is states are supposed to come up with plans to implement it in their state. That makes some sense for conventional air pollution for a lot of reasons I won't bore you with now. Once this rule is made final, I think next June it becomes final, the clock starts ticking, and states are supposed to submit a plan within a year of how to satisfy these targets the E.P.A. has set out for them. That's a high order. There's all kinds of problems. State departments of environmental quality actually don't have jurisdiction over electricity grids, so they're going to have to get the public utilities commissions, and these inter-agency task force, and ... the bureaucracy's going to be wonderful. I am wondering, and hoping, especially in light of the election results, that there are going to be a number of states who said no to Obamacare will say no to the E.P.A. Because, by the way, the fallback of the clean air act has always been, if you don't do a plan, we'll come in and do a plan for you and impose it on your state. It's so much better if you do it, because you're closer to things. Well, you know, if 20 states said, no, we're not going to do this, and the E.P.A., yes, has the legal authority to come in and say, we're going to impose a plan on you, then, but I think it would break the E.P.A. to try it. And I'll bet they're terrified of that idea. Which is why I'm going to be encouraging governors and state legislatures to say, no. We're not going to do this. There's going to be a legal challenge, and so it'll be in limbo for a while, but I think that's the right ... No, we're not going to do this. Finally, on this, and then I'll move to a conclusion and questions ... The target emissions reduction is just 30% from the electric power sector, which is only one of ... which only accounts for, what, 35% of our emissions in the U.S. overall, I forget. In other words, we're talking about maybe, if it really worked, a 10% reduction in total greenhouse gas emissions, if it all worked according to plan. The E.P.A. touts enormous benefits from doing this. We'll reduce ozone, we'll reduce particulate pollution. Of course, that's what the clean air act does already. It's happening very fast, so they're just proposing to do the same thing they're already doing, only in a different way, and more onerous. There's one thing conspicuously missing from the claims of benefits in the E.P.A. 's assessment: they make no claim that their regulations would affect climate change. And that's because it won't. You know, I tried to get a couple reporters to try asking at the White House press ... but, it would just punt to the E.P.A., but, the question would be, if you run full ... assume this plan works like a charm and you meet all those emissions targets. What difference would it make if you ran that through the computer climate models through the year 2100? The best guess is, it would change the temperature by two one-hundredths of one degree. Which is, actually, you know, inside the margin of error. In other words, it makes no difference, right? So, why are we doing this? Well ... oh, by the way, and even Al Gore ... someone asked about… are you going to mention Al Gore? And I said, I wasn't sure I would, but he described the E.P.A. proposal quite revealingly as symbolic. Al Gore, in a rare moment of honesty. The environmental movement is delighted about this after saying they didn't want to do it this way because they love bureaucracy, and I think what they're hoping is, is once you cement in place the E.P.A. 's authority, a 30% reduction can be ratcheted up to a 50% reduction, and then a 75% reduction, and then, maybe 100% at some point, all on the authority of the E.P.A. alone, bypassing congress. Let me move towards a conclusion and one last quick point, my third funny thing, which I can do in just one paragraph, actually. Here's ... the point of this middle point of my analysis. The second funny thing is: the cruel irony for the climateers is that the worse the dimensions of climate change, the more farcical are their proposed remedies. So, you know, we may try to close 500 coal plants, or about ... still a little over 500 coal plants, but right now there are 1,000 coal plants under construction elsewhere in the world, and my guess is, we're going to build another 5,000 of them, at least, in the next 20 years. Because, as the Chinese put it to Al Gore in 1998 in Kyoto: we don't understand you Americans. You expect us to be poor forever? And the Indian said to him ... this has never been reported, by the way. The Indian said to him, when he was trying to bully them. He had to join in this madness. He said, you know, you got rich on fossil fuels. Now, it's our turn. When we're as rich as you, then we'll talk about emissions limits. Well, that's about 75 years off for India. And, so, the real deniers today are the climateers who refuse to consider that their case for catastrophe has weakened, while promoting completely unserious solutions that do little or nothing to stimulate the energy transition they say they want. Their default position continues to be simpleminded exaggeration or distortion of every possible angle. Know what? Somebody'll say today: it's warm today. It's global warming. Next week, it's going to be really cold, here. It'll be climate change. Right? So, that's the distortions. And the opinion polls show that the public has a case of, what I call, apocalypse fatigue. And, so, they've rankly politicized this issue and demonized any self-criticism even within its ranks. You know, there's this one lady ... Judith Curry at Georgia Tech, who's always been in the conventional climate science community until five or six years ago, she started saying, you know, I think maybe we have some things wrong, here. And we should re-think some things. And, by the way, we ought to talk to some of the climate skeptics instead of screaming at them. Well, guess what's happened to her? She's been cast into outer darkness and she was the chairman of the, what, the geophysics department at Georgia Tech. Person of considerable scientific chops. That's what happens if you raise a dissent or a doubt. Finally, I said that there was a third funny thing that happened, and that was the unexpected revival of oil and gas. And, I want to use that to say ... as I say, Robert Bryce and Mark Mills will talk about this tomorrow in what's ahead, especially Mark, he has a degree in engineering from M.I.T. He really knows the nitty-gritties of this. And it's true, what people said today, what ... Ann McElhinney said last night, and what I've just said, the environmentalists are relentless authoritarians. On the other hand, think how depressing it must be to be an environmentalist right now. And to see this surge in natural gas and oil production going on that's going to spread around the world, right? I mean, for the longest time, the environmentalists said, we've just got to get to using renewable energy and banana peels and whatever else because we're going to run out of oil and coal and gas. Anyone remember peak oil? Anyone heard of peak oil lately? And now the problem for environmentalists is that we're not going to run out of these fuels anytime soon. Again, ten years ago, environmentalists were saying, you know, we're for natural gas. It's a bridge fuel, they'd say. Now, they're against natural gas. They've gone all John Kerry on us. They were before natural gas before they were against it. And ... you have to know environmental folklore here, and I'll end with this. As recently as 1998, that was when the first Kyoto treaty was signed, environmentalists thought, hey, we're on our way. This Kyoto thing is going to work. In 1999, all the leading environmental groups in America said, the leading environmental problem of today is suburban sprawl. And that's when they made a big push in 1999 and 2000, because they thought, well ... we've signed the treaty. Right? That's a particular tic of the liberal mind, right? You've solved problems by having signing ceremonies on the White House lawn. And if you had predicted to an environmentalist in 1998 that not only would the Kyoto treaty go down in flames, that there would be a massive revival in oil and gas, that the price of natural gas would go from $14 down to 2 and it would suddenly be abundant as far as the eye can see, I think they might have marched out into the sea and drowned themselves. Come to think of it, maybe that's not a ... anyway, I will stop there and turn to your questions and comments. Thank you. I can't see very far, anymore, so it'd be good if you ... Facilitator: I'll point em out. Thank you, Dr. Hayward. We have a couple microphones here. Please raise your hands and stand up when the microphone gets to you and, also, they will hold the microphone for you. Thank you. Dr. Hayward: It's just like a classroom. Students never want to ask the first question after a lecture. There's a brave fellow. Go, sir. Dr. Kenneth Hayes: Yeah, I have two questions. Do you know where 2014 is targeted to be in terms of the hottest years on record? Is it going to be in the top 10, or the top 20, top 50? Dr. Hayward: Yeah, it's somewhere in the top 10 or 20, yeah. Dr. Hayes: Yeah. It's headed to be number one. Dr. Hayward: There's dispute about that. Dr. Hayes: Well, we just have to wait another six or seven weeks ... Dr. Hayward: Right. Dr. Hayes: ... we'll know the answer, but have you looked at the hottest months of the year? Have you looked at May, and April, and June, and July? They've been the hottest months on the planet this year. Have you followed that? Dr. Hayward: Yes ... if you look at the satellite data, it's not looking that way. That's based on the ground temperature data, and that's a big, furious controversy, as I'm sure you must know. Dr. Hayes: I understand the data pretty well. Can you summarize ... Dr. Hayward: ... And by the way, so what, by the way. I mean, so, you want to have a debate here, fine... Dr. Hayes: So what? So what, it's the hottest ... it'll be the hottest year on record... Dr. Hayward: Well, we've been up in the plateau, I expect all these years to be among the hottest of the last century. Why is that news? Dr. Hayes: Well, can you tell me what evidence you have that there's been a pause in the warming? Can you tell me that evidence? Briefly. Very briefly. Just a little bit. Dr. Hayward: I'll give you three words: satellite temperature record. Razi Lane: Thank you very much for your time, coming out today, this evening. My question's going to be going back to your talk about Dr. Richard Lindzen, dealing specifically with climate models in and of themselves. What, in your opinion, is the specific flaw with hockey stick graphs and stuff that the I.P.C.C. uses, specifically, what foster things such as the Kyoto protocol and the U.N.F.C.C.C., and how can we go about addressing that in today's modern era? Thank you, sir. Dr. Hayward: Wait. Hold on, you had two or three parts, there. One was hockey stick? Is that right? ... Razi Lane: Yes, sir. Dr. Hayward: ... And then I.P.C.C. what? I didn't quite take it all in. You're going fast. Razi Lane: Sorry. Yeah, basically just the climate models, themselves. What the flaws are, how can we go about addressing those? And, the hockey stick graph as one of those models. Dr. Hayward: Yeah. The hockey stick's not a model. That's a temperature reconstruction based on a whole lot of what we call proxy data. I quit following that, too, after about ... when did the national academy of science's report on that come out, 2007 or 2008? And ... that was before you had the email ... the email leaks that were so interesting because what it showed is so many of the people who had worked on that didn't care for Michael Mann very much at all. It's pretty funny. To read those. The National Academy of Science has put a report out in 2007, 2008 about reviewing the hockey stick, and news headlines all said, vindicates hockey stick! I read the report. Guess what, it said something else. I'll have to do this from memory. I wrote it all in a couple of articles. Toward the end, they did several things. They criticized Mann and his collaborators, Bradley and the other guys, for not sharing their data. Not being transparent. Second, they said ... the National Academy of Science, Gerald North at Texas was the guy did ... they were given the data and they looked through it, went through all the stuff, and they said, looks to us like this is only really reliable back about 400 years. Before that, we're making stuff up. That's not quite the language they used, but that's what it said, and in their press conference they sort of said, you know, we've overdone this whole thing. And that's kind of where things were left. And then, like I say, when the emails came out, I wrote two articles about it... long articles in The Weekly Standard that just went through, saying, look what some of these guys say about each other and about the limitations of their own work. It was pretty revealing and pretty amazing. Partly, it was a "circle the wagons" thing. They didn't want to admit any of those doubts or uncertainties in their own work. So ... and now, of course, Michael Mann is suing National Review and ... what's his name, Mark Steyn, right? And it's a bizarre suit as a libel matter, and we'll see how this goes. I mean, I can't imagine they really want to get into discovery on this. I don't know what Mann's thinking, so, that wasn't a model, that was a temperature ... what does the past look like, right? I guess, the other point of it is, the I.P.C.C. adopted, or, inserted that thing in their 2001 report at the last minute. Most of the people who worked on ... never saw it. And that raised a lot of people's ire. Because it seemed to be put in by the politicians at the end. So, someone else? Man: Thank you very much for coming out and speaking. Just a question for you. Because you alluded to this during your whole speech, but never really explicitly said it. How do you separate the science from the politics? In other words, you talked about the ... it being described as a "belief" and then, all of a sudden, this one lady was just going out and saying, this is what I found, and then she was actually cast out. How do you separate that? How do you find the truth in all the muck and all of the political banter? Dr. Hayward: Yeah. That's a good question. Did you all hear the question? It was, how do you separate science and politics, is that a fair enough a re-summary? Here's the basic problem, and maybe I should've put it this way. Science tells us what is. It doesn't tell us what to do about things. I mean, a corollary position might be ... let's go back 20 ... let's go back to the late ‘70s when, by the way, if you go back to newspapers ... the leading environmental problem, according to Jimmy Carter, was acid rain. Let's study the matter. We spent ten years on NAPAP: National Acid Precipitation Assessment Project. It concluded, in three volumes, that the problem was real but overstated. But, then, what do you do about it? The report didn't say what to do about it. That's what science out to be about, is describing how something happens. Now, what happens here and, you know, the people who have thumped the 97% business like to say: the scientists all agree that we're doomed, and therefore we have to have the Kyoto protocol? Most scientists are not very good at public policy analysis. And a lot of them will admit that, by the way, and a lot of them, you know, there are a lot of them out there. What happens is, the noisiest of them, people like Jim Hansen at N.A.S.A., who I've debated twice and come to the conclusion is a manic-depressive. You know, I think they ... I don't know. You've always had some scientists who've wanted in on the action. That's not true of climate, that's been true of a lot of things. But that's always a problem in science and policy, and ... yeah, we don't do a very good job of thinking about all that. So, someone else? Somebody there I can see ... Don Thorson: The point that I find quite interesting, if you listen to T.V., and they give you ... oh, we hit a new record today. The last record was 1935 or some such time. So many records were set in the ‘30s, and maybe we exceed them by a point or two ... by a degree or two. I don't know what was warming it up so much in the ‘30s. The other point is, very short, there's a very good reason they called Greenland, Greenland: it was warm. Dr. Hayward: Yeah, no, I mean this is what I call the Groundhog Day aspect of the issue, right? We go back to some of these arguments we've been having for 20 years, now. I mean, I know one guy, Daniel Botkin, who's now emeritus professor in environmental science at U.C. Santa Barbara. He is doing this big ... so, we try and find all these things in the past to try and find out something. He's going through ships' logs from the 19th century up in Hudson Bay. This is back when those British sailors would record, you know, what tea they had in the morning, right? To try and see ice extent and see if he can match it up, so we're always trying these clever things to try and figure it out, but that only goes back 150, 200 years, right? So here's how this happens. There were probably ten articles published today in the science journals on some aspect of climate. It's the big field right now. Maybe it's 25. And you can't keep up with them all. I've tried to keep up with them the best I can in Nature, and Science, and some of the summaries, but it's impossible. That's why I work on the policy of it. Let's assume ... again, thought experiment. Let's assume it's true. Kyoto? I mean ... as the gentleman was saying, it's going to be the hottest year. You still haven't given any solution that's in the real world at all. Barbara: Hi. Two different contradictory things. Both accurate, both within the last year. Both in the northern and southern hemisphere, the Arctic and Antarctic ice floes are melting. That's true, so far as I understand. Secondly, Toledo, Ohio this last year had more snow than any time in its recorded snow measuring history, which goes back to approximately 1880. So, some things are hotter and some things are colder. Your comments? Dr. Hayward: That's why most climate scientists will say we have, at least in the short run, and even the long run, a chaotic system. The polar vortex, that's not that unusual. I think we had a lot of those back in the ‘70s. We had a lot of really cold winters in the 70s around here. I don't think we were looking at it quite in the fine grain way we are now for climate reasons. Yeah. I haven't looked at the latest ice data for a year or so. So, the arctic ice cap is about, I'm going to say ... this could be wrong by ... about 30% below where it was in the late ‘70s, when we started the satellite measurement. And that was just steadily down, then you had a big drop in ... 2008, was it? Then a rebound, and ... it's not clear, yet, we haven't had enough to ... this last year looks like we had a bit of a rebound up. So, we'll see what this winter looks like. Might want to see that for four or five years before you see if it's actually reversed trend. Facilitator: We have time for one more question. Dr. Hayward: One more? ... Okay. Man 2: The question I want to ask, kind of following a couple points, is: you know, most climatologists in the mainstream tend to blame carbon dioxide and other greenhouse gas emissions for causing temperature aberrations. What is, kind of, happening with science's accepting of the notion that perhaps something else is to blame? I know ... a Harvard researcher, I believe, Willie Soon went up to the arctic ... developed some charts ... and he came up with the theory, and several others have come up with the theory, that total solar irradiation was to blame ... Dr. Hayward: That which? Sorry? Man 2: Total solar irradiation. Basically, solar activity. Sun activity. And also I know some scientists have attributed it to oceanic oscillations. And so, you know, given that those theories seem to match up with actual temperature data far better than carbon dioxide does, is there any growing acceptance in the scientific community that maybe these things are factors more than human action? Dr. Hayward: Well ... the short answer is, I don't know because ... I mean, I've used the shorthand of the scientific community, but there's a lot of variation in the scientific community. There's a lot of popularity with, yeah, the ocean oscillations, that's a well-known phenomenon. There is a theory popular with people like Hansen, Jim Hansen. It sounds a little odd, but black carbon. That the shrinkage of the Arctic ice cap owes more to changes in albedo. What that means is: the snow's actually darker. It doesn't look darker to us. But the sun and radiation balances all the rest of that. It's darker, therefore it absorbs more heat, and then it melts. Now, where's that coming from? Well, you know, our coal emissions, or China mostly, but ... not quite sure about that. But ... so, there's a lot of thought on that, and, you know, that does make a big difference. If it's that, that turns out to be fairly easy to control... without even getting rid of coal, I mean, we've gotten rid of our, you know... we've got scrubbers on our coal plants. China's new coal plants are much lower emissions than the one they've been building in the last 20 years because their air's so bad. And, so if that's true, it might be a declining problem. The solar radiation thing has ten different variations at least. And I'd be hard pressed to get into great detail about them. And, so, I just, I let them thrash all that out. So, that's about the best I can do on that, because there's a wide menu on all of those things. Oh, that's right, you said we're done. Facilitator: Very good, yes. Thank you very much, Dr. Hayward. The hospitality will begin here on the mezzanine for our guests and students, you know what to do hopefully by now. Thank you. Dr. Hayward: What are students supposed to do, go away? Facilitator: Go on the left. Dr. Hayward: Oh, okay. Facilitator: Very good. Dr. Hayward: Yep. The Republican state convention met on September 8 at Saratoga, New York. Frederick W. Seward was nominated for Secretary of State by acclamation. Francis E. Spinner was nominated for Comptroller on the first ballot (vote: Spinner: 259, A. S. Diven 49, Edwin D. Morgan 36, W. W. Palmer 23, E. B. Judson 18, Calvin T. Hulburd 4, Francis C. Barlow 3). Edwin A. Merritt was nominated for Treasurer by acclamation. George F. Danforth was nominated for Attorney General on the first ballot (vote: Danforth 258, L. B. Prince 149). Oliver H. P. Cornell was nominated for State Engineer on the first ballot (vote: Cornell 301, Joseph N. Green 71, Charles H. Fisher 12, George Geddes 1). William T. Tinsley for Canal Commissioner, and Benoni I. Ives for Prison Inspector, were nominated by acclamation. The Democratic state convention met on September 16 and 17 at Syracuse, New York. John Bigelow, a Republican, was proposed by DeWitt Clinton Littlejohn for Secretary of State, and was nominated by acclamation. Ex-Comptroller Lucius Robinson (in office 1862-1865) was re-nominated by acclamation. Charles S. Fairchild was nominated for Attorney General during the first ballot. Charles N. Ross was nominated for Treasurer on the first ballot. John D. Van Buren, Jr. was nominated for State Engineer by acclamation. Christopher A. Walrath for Canal Commissioner, and Rodney R. Crowley for Prison Inspector, were then nominated amid great noise and confusion. 20 Republicans and 12 Democrats were elected to a two-year term (1876–77) in the New York State Senate. 72 Republicans and 56 Democrats were elected for the session of 1876 to the New York State Assembly.